My name is Julie Prescott Burgess and I am applying for acceptance to the master of arts in ministry program at Creighton. By way of introduction, I am 56 years old, married for thirteen years to my beautiful Steve, and live with and care for my head-injured older sister Jana, who is one year older than me. She was hit by a train 32 years ago in Longmont, Colorado. It was a turning point in her life and mine as well. Baptized in the Roman Catholic church shortly after I was born before Christmas in 1958, I made my first communion in the second grade. It’s a moment that marks my life in many ways. My mom had died a few months earlier leaving seven children with my dad, ages nine to fifteen months. I was seven. On such an important occasion in the life of a young Catholic girl, I was enveloped in the love of the Servants of Mary who were teachers at Christ the King School where we attended. Being a shy, introverted young one without a mom, three wonderful sisters took me to get my hair done, took me out for lunch, and hustled me out of mass later that evening as the gravity of approaching the altar to receive the body of Christ caused me to get nauseous. Those same three women brought me back to the rail after mass was over so I could receive communion for the first time. One of those nuns was my first grade teacher, Sr. Mary Amy, whom I recently became reacquainted with through my blog. Her name is Joyce Rupp and she is quite a leader for those seeking a deeper walk of faith. The first word I remember learning from her was SURPRISE. It was a lesson that stuck with me and in our correspondence, she said she remembered it too. I tell you that story because it was a marker in my life. Surprise. Remember. Communion. Those three things are the descriptors of my life. Two months ago I left my position at West Hills Church here in Omaha, where I served for thirteen and half years, the last ten as the church administrator. I was called to employment there by an amazing pastor who mentored me, discipled me, pastored me and was my friend. He died in November, 2012, four days after I returned from my second trip to Iraq to be with the Presbyterian church. Because of George’s belief in me, I found the strength to step out of Omaha and travel all over the world to experience the church in many contexts. I spent time in southwest Germany, including a short stay with a German family. As a group, we celebrated Corpus Christi Sunday. Even though we were there with the protestant church, the local Catholic priest gave us all the opportunity to receive communion. As a baptized Catholic, but now a member of a Presbyterian church, I thought this was a wonderful moment of communion and community. It was a surprise! I had the opportunity to travel to Cameroon in west Africa twice, spending time with the Presbyterians there whose church was founded by German and Swiss missionaries. In those travels I met a Cameroonian Sunday school organizer, almost exactly one year my senior. Joe had only a fourth grade education, but he had a call to be a pastor. With the prayers of my family – husband and sister – we managed to see him through four years of seminary, and he is now ordained. As two families – one Cameroonian, one American – we walked this journey together. Surprise! Communion. And I remember. And then the Middle East happened. I traveled first to Lebanon and Syria in the summer of 2010. Although it was to learn about Presbyterian churches started in those places in the 1850s, we had amazing meetings with Greek and Syrian Orthodox clergy. I met Syrian Archbishop Yohanna Ibrahim in Aleppo, a man who was kidnapped in April, 2013, and has still not been heard from. My nightly prayer is for his release. I met Iraqi refugee families who were being cared for by the Presbyterian church. I ate dinner in the home of the Aziz family and heard firsthand of the devastation of our 2003 invasion on their lives. But I also experienced the hospitality and faith of this Syrian Orthodox family. Surprise. Communion. I remember. I have traveled back to Lebanon and Iraq and Syria a total of eight times. And each time I come away convicted that the most important word in the Bible is “with.” I have spent time with the church – the body of Christ – in worship, in fellowship, in communion. I stood on the Chaldean Catholic Church rooftop in Kirkuk, Iraq, with the man who is now their patriarch, Louis Raphael Sako. As we stood there and looked around, he reminded us that there were snipers in the buildings around us and we needed to be careful, but he stood there with us so we could pray for that city. When we presented him with the gift of a crystal cross, he remarked that it was fragile, like their hope. His honesty in that moment was a surprise, and he shared that candor with our community. In the waiting for a visa to return to Syria to once again be with the church there in this very difficult time, I had one of those surprising moments of community with the now retired president of the Near East School of Theology, the seminary in Beirut. Her name is Mary Mikhael and although now a Presbyterian, she grew up in the Greek Orthodox Church. As a small girl, she wasn’t allowed behind the iconostasis like the boys, so she crawled through a barred window at every opportunity to see what was back there that girls couldn’t see. Mary has had an amazing life of ministry since those days, and there was no barrier put in her way that would keep her from her call to serve. The only barrier in front of me is, well, me. In that moment, I knew I would apply. And so I am. I hope this letter isn’t too long, but I wanted you to know some touchpoints in my journey of faith. I have come to know and love a cloud of witnesses who have helped me put hands and feet to my faith. People like the al Saka sisters, formerly of Mosul, driven from their home last July by ISIS. Their brother was murdered by extremists in 2006, and they took as their duty the protection of their church for all those years until they had to leave. People like Rev. Ibrahim Nseir and his wife Tami of Aleppo, whose church building was destroyed in 2012, but have held it together and continue to meet in a fifth floor apartment with no water or electricity. Hope exudes from them as they are about to complete a new church building in a city that has been 60% destroyed by war. People like Elder Zuhair Fathallah in Basra, who has led his church for almost ten years since their last pastor left and leads a small but mighty band of disciples in a kindergarten ministry where 98% of the students are Muslim. People like Mazar, a man who still lives in Homs, Syria, who tried to stop the assassination of Fr. Frans vander Lugt, the Dutch Jesuit priest who was killed right before the siege of this city was lifted in the last half of 2014. I had the humble privilege of praying at his grave in the courtyard of the Jesuit monastery, where a small group of people were feeding up to 2,500 people a day who had returned after the siege ended. This cloud of witnesses inspires and encourages me to step out in this way. 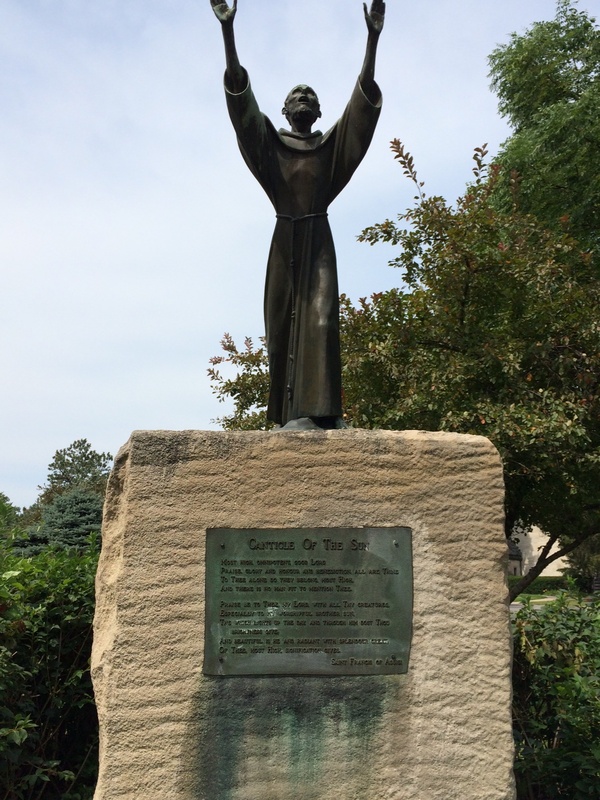 I want to come to Creighton to study ministry. My mom graduated from CU in 1955, and sixty years later I think she would be so happy to know that one of her seven has chosen this path. I want to study in a Jesuit institution and serve wherever God calls me. I want to be a link between Catholic and Protestant to remind us all that we are parts of the same body and we can’t say we don’t need one another, because we do. I want to continue to learn and to travel in God’s world and bring back the surprising stories of his people. I want us to know and remember the saints who came before and the ones living now in difficult places. I want to bring those too tired or sick or disadvantaged to the communion rail. If God opens this door for me, I want to walk through it. H.W.S. Cleveland was a landscape architect of the 19th century, and as I have been walking through my own neighborhood these past two months, I have come to appreciate how he helped my city develop some beautiful parks. I live on Happy Hollow Boulevard, part of the system of city streets that were planned to link the Omaha parks together. Happy Hollow winds beautifully along two of the bests parks in Omaha: Elmwood and Memorial. And in my daily steps along the sidewalks and paths, I have come to find rest stops for my journey. A panoramic view of Memorial Park facing west from the path. 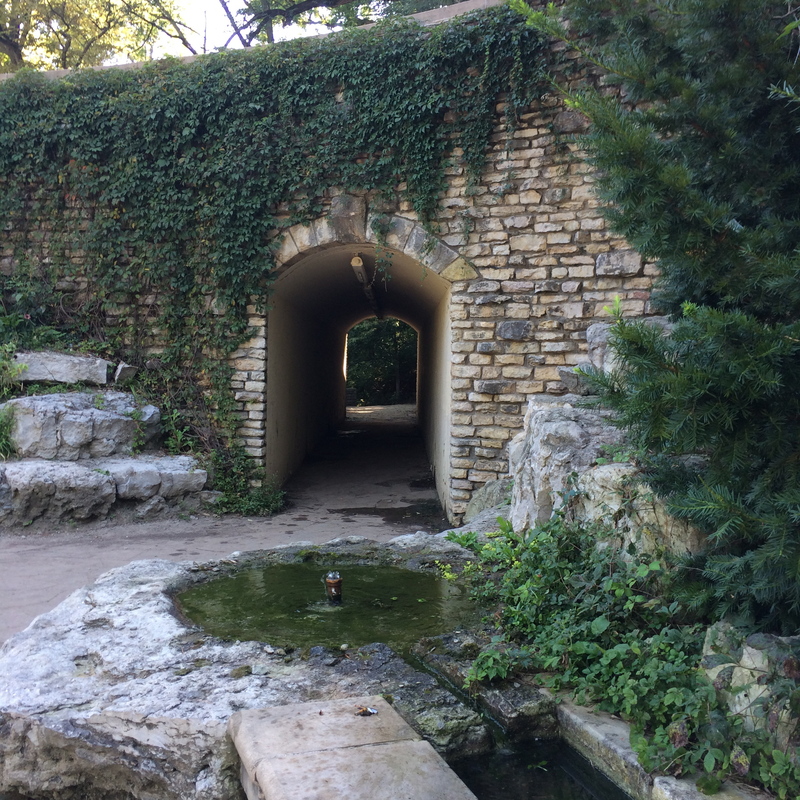 The grotto at Elmwood Park with its natural spring running through the channel. “He leads me in paths of righteousness for his name’s sake…” goes the 23rd Psalm. 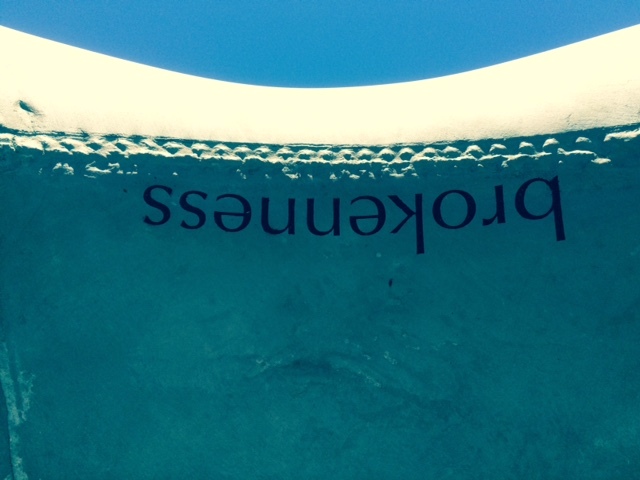 Beside still waters. Green pastures. All these things are in this amazing section of Omaha that I find myself wandering through. As I think about my friends in Syria, Lebanon and Iraq, or my family in crisis, walking has become a prayer time for me as I put one foot in front of the other, and doing it in green pastures with still waters and carefully planted trees and flower beds, is a reminder that this God who made and loves us all, is there with me at each step. Between the two parks is my college alma mater, the University of Nebraska – Omaha. 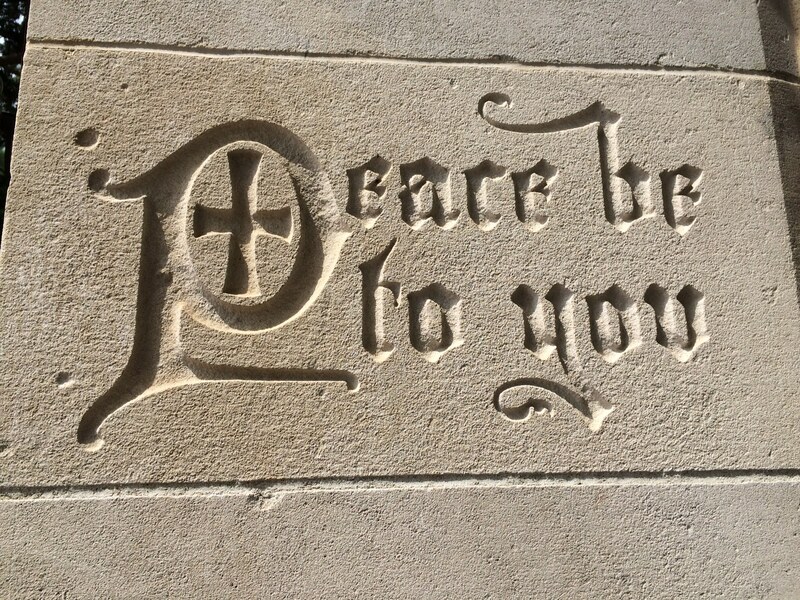 As I walk through the campus, I have found other places that also remind me of how God has unique ways of encouraging me on this daily journey as I seek his pace, his peace. 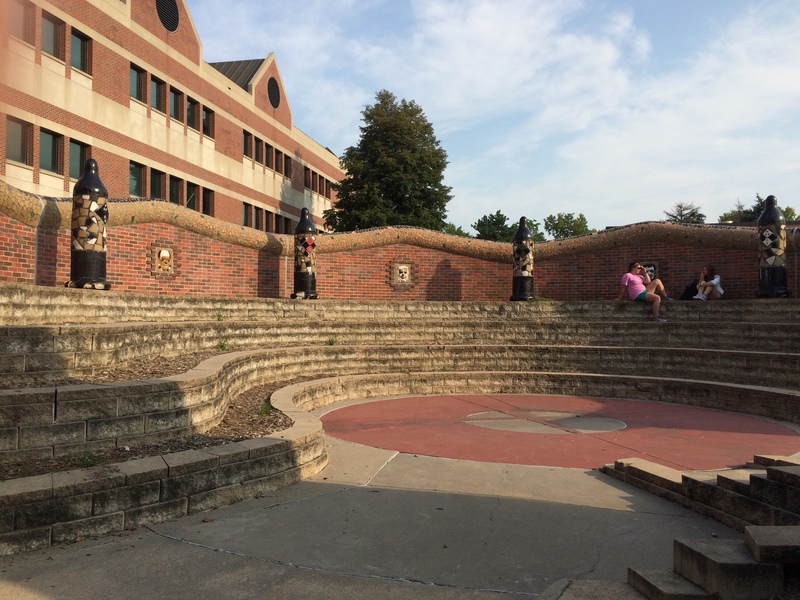 There is the Castle of Perseverance, an outdoor amphitheater designed by Andrew Leicester of Minneapolis. 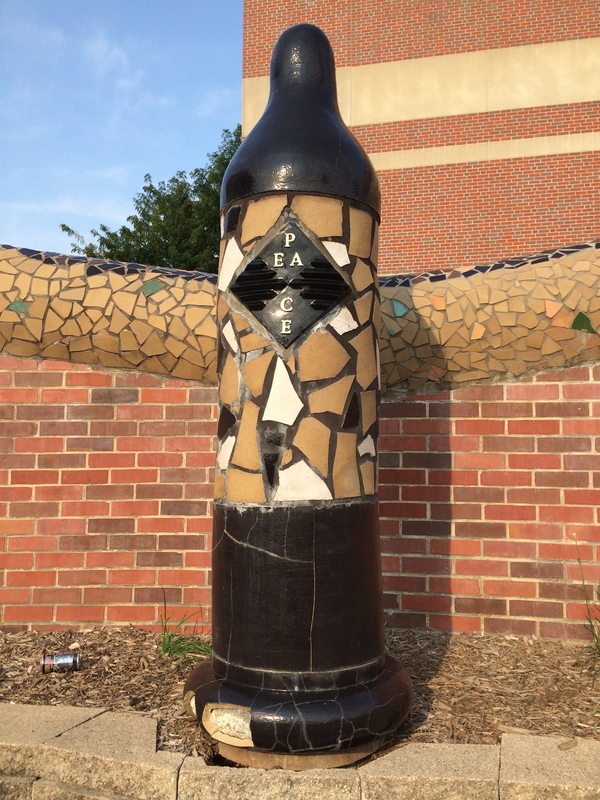 I came upon it one day several weeks back as I chugged uphill from the College of Fine Arts, and the first thing I saw was this: the word peace on a missile-shaped sculpture. I followed the semi-circle around and found justice, mercy and truth to complete the set. “Act justly. Love tenderly. Walk humbly.” My six-word reminder from Micah 6:8 was echoing through my head. Suffering, perseverance, character, hope. Steps on the journey of the family of God in Syria, even as I write this. Never have I seen a people who model hope in such times of suffering. You are faithful to the end. Walking down the hill and into Elmwood Park, past students scurrying up the hill to class, I come up the east side of the park and find the Sounding Stones, which I’ve written about before, Sounding Stones. Brokenness. Humility. Submission. Simplicity. Community. Each of those is part of our journey, my journey. And each one invites a prayer. 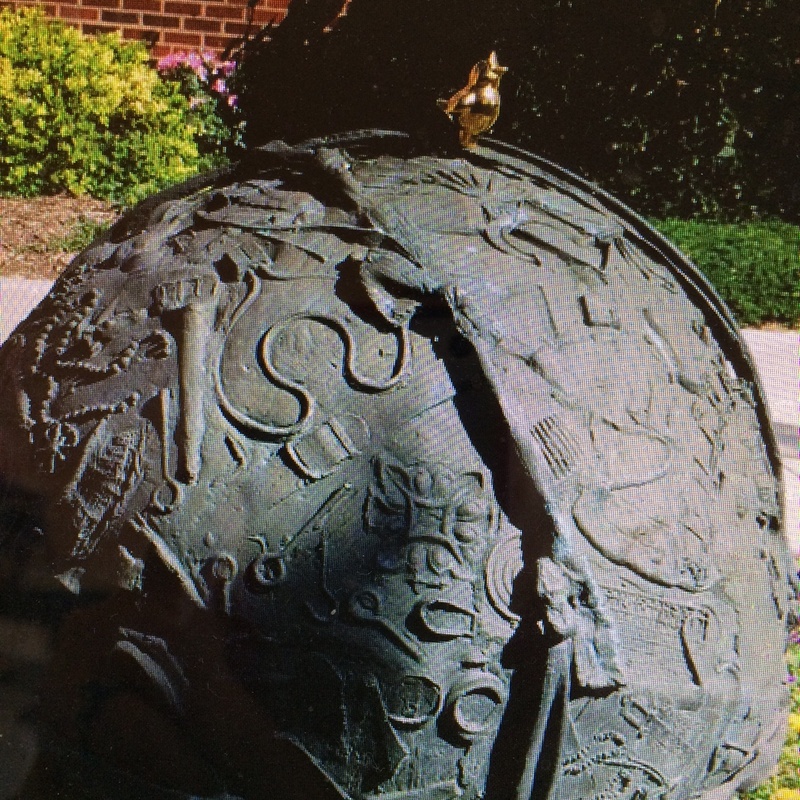 My prayers for peace – dona nobis pacem – are so centered in that stone of brokenness these days. Whatever language the word is spoken in, I want to be a conduit of peace. Let my words speak it. Let my actions be its witness. And I am so grateful for these reminders in these rest stops along the way – in green valleys, in still waters, in righteous paths.